Daily News , N.C. - Peggy Fleming remembers hearing the news from her mom, while she was preparing for another school day in northern California. She was 12 years old at the time, a precocious rink rat, and then suddenly her little community of American figure skaters was wrenched and twisted inalterably. "My mom heard it on the radio and told me, " Fleming says. "It was like watching a bad movie. It wasn't real. It took your breath away and took a lot of time to sink in. This sport draws out the deepest part of your soul." 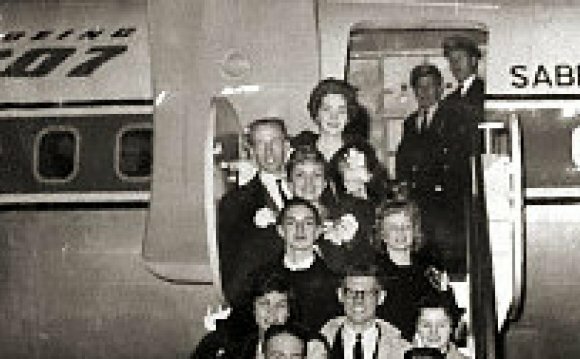 There had been a plane crash on Feb. 15, 1961, a terrible one. Sabena Flight 548, a Boeing 707 that had taken off from what was then called Idlewild, cracked hard into the ground after circling a Brussels airport three or four times before a planned landing. Investigators later hypothesized it was the jet's stabilizers that probably failed, though nobody could be sure. The plane exploded. There were no survivors, other than a dog in the cargo hold. Sixteen members of the U.S. team perished. They were on their way to the world championships in Prague. So, too, had 16 American skating coaches, officials and family members. These Americans were royalty in the sport. The future kings and queens of skating lay broken into bits in a field near Berg, Belgium. Lost in the wreckage was Maribel Vinson-Owen, the nine-time U.S. champion and by then the coach of her two incredibly talented daughters, who were also dead: Laurence Owen, just 16, the graceful American champion and a favorite at the Prague championships who had appeared on the cover of Sports Illustrated just two days earlier, and Maribel Y. Owen, 20, a pairs champion. The victims included Bradley Lord, 21, the U.S. men's champion, and a young, promising upstart named Greg Kelley, 16, from Newton Center, Mass. "You can't adjust to that, " Kelley says. "My parents never really recovered. We had to fight like heck to get some information, and then after about two weeks, two bare, squared-off, European-style coffins arrived from Belgium." Fifty years later, it is still difficult to imagine how the sport managed to endure and thrive in America. Yet from these ruins would rise Fleming, the gold medalist in the 1968 Olympics, and later many other champions. Then on Friday night at the national championships at the Greensboro Coliseum, long overdue, the dead from this tragedy were inducted into the U.S. Figure Skating Hall of Fame. Relatives of the fallen were on hand, finally gaining some closure to a catastrophe that stole precious decades from the beloved athletes. There was a screening of "Rise, " a film celebrating that lost team - a movie that will be broadcast live on Feb. 17 from the Best Buy Theater in Times Square to nearly 500 theaters nationwide. There was a meticulously researched book available, "Indelible Tracings, " by Patty Bushman, detailing the lives and circumstances involved. And then there was an on-ice ceremony, hosted by Fleming and fellow skater Paul Wylie. The U.S. team that perished in 1961 was a transitional one, much like the group of skaters here this week for nationals. Then, as now, it was the year after a Winter Olympics. David Jenkins and Carol Heiss had both won gold medals at the 1960 Squaw Valley Games, before retiring from competitive skating. Heiss was actually filming, "Snow White and the Three Stooges, " when the plane crashed. Larry Fine and Moe Howard were extremely upset and supportive. The studio told her she could take some time off from filming, a generous and unprecedented offer. The U.S. team that had flown and crashed on Sabena Flight 548 had qualified during the national championships in Colorado Springs, an event televised for the first time. Looking at them now, the events appear absurdly formal and cautious on those black-and-white films. The natural grace of Laurence Owen and the athleticism of Doug Ramsay is evident even then, however. There were coincidences and circumstances that doomed some skaters and rescued others. Tim Brown, a highly rated skater, became ill during at the U.S. championships and literally skated off the ice during his performance. He was replaced on the world team by Ramsay, 15. Brown felt such guilt from this happenstance, he'd later write an apology to Ramsay's surviving relatives. Diane Sherbloom had joined Larry Pierce as his ice dance partner only five weeks earlier, because Marilyn Meeker suffered a broken bone in her foot during training. Meeker was heartbroken at the time, yet that injury saved her life. "Who knows why?" she says now. There is an answer to that, of course. "It's always been difficult, " says Christie Davies, who is the niece of Bill Kipp, a coach from Allentown, Pa., killed on the plane. "I'll be watching an event on TV, and I'll see someone who looks like Bill, who skates like him – Brian Boitano, or Michael Weiss. Then the tears come." Davies saw off her uncle in Philadelphia, before he headed to Idlewild for the doomed flight. Like everyone else in this cozy business, she can connect the dots from Kipp to the modern era. Kipp coached Fleming for a few months in California. That evolutionary path offers considerable comfort. Fleming, whose family was not rich, received a pair of free figure skates through the memorial fund established by skating officials. She also learned her craft from watching Laurence Owen and the other two top women at the time, Stephanie Westerfeld and Rhode Lee Michelson, both killed in Belgium. "I was a combination of Laurence, with her freedom, of Stephanie, who was so beautiful and lady-like, and of Rhode, because I wanted to jump like her, like the guys, " Fleming says. The growing-up process for Fleming and others was accelerated. In 1964, just three years later, the U.S. team somehow captured a medal at Innsbruck. Young Scott Allen, 15, a Newark-born skater, won bronze. Fleming was hurried along, too. She was sixth at Innsbruck. By 1965, she was anointed the great American hope. "I achieved things faster than if it didn't happen, " she says. "Who knows how great, for how long, they might have been?"